Turned into a Latin American saint, worshipped by thousands of Argentinians, the subject of an Andrew Lloyd Webber musical and more recently a film starring Madonna, "Evita" has been the subject of much attention over the years. Part of this cult is due to her working class background, her ability to become a "working girl makes good" which appealed to a Tory like Lloyd Webber tuning into the Thatcherite yuppie boom where some people from a working class upbringing were able to make large sums of money. Also superficially appealing are her apparent championing of the poor and her welfare reforms which appeals to a Labourite like Alan Parker, director of the film and supporter of old Labour. Eva Duarte was born in a village 150 miles to the west of Buenos Aires. The facts of her early life are obscure, not least because of her efforts in later life to make out that she was younger and had come from a poorer background than was true. When her father died at seven, the financial position of her family took a plunge. By 1934, however, Eva's mother had increased her wealth by her running of a boarding-house. Eva Duarte moved to Buenos Aires, where she became an actress. She was a successful radio performer in 1943 when the Army overthrew the Castillo government. Realising that the Army were the important people to know now, Eva Duarte became the lover of Colonel Imbert, Minister of Posts and Telegraphs. But her aims were higher. She deliberately sought out Colonel Juan Peron, seen as the strong man among the colonels. Peron, an ardent admirer of Hitler, had been a driving force in the Group of United Officers that had engineered the coup. Peron realised the regime could not survive for long without the help of other sectors of Argentinian society outside the military. He looked for the active support of the working class. He was put in charge of the Ministry of Labour as a first step in this manoeuvre. 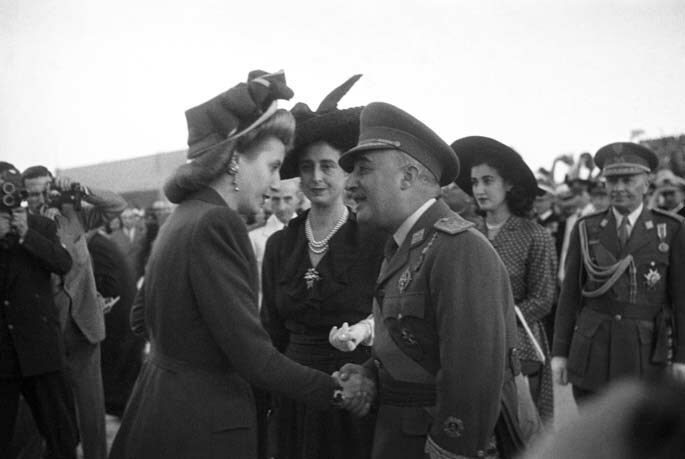 Peron first met Eva Duarte at a concert given for survivors of an earthquake in January 1944. The charity work she did there was to become a large part of her future career. The publicity given from the charity work put her in the spotlight, helping her in her showbusiness career. Peron was also using the earthquake tragedy to put himself forward as a champion of the poor, indeed Eva Duarte sang his praises on the radio before she had met him. At the concert Eva jettisoned Imbert, and became Peron's lover. As a result Eva Duarte began to get leading roles in radio plays, as well as starting to appear in movies. Now Peron became Minister of War, an important position. At the same time he had been building up his control of the trade unions. The union leaders were coming together in an alliance to force a reformist project on Argentinian society. This coincided with Peron's populist plans, based on the tactics of Mussolini, to bind the unions to him. He encouraged a rank and file leader, Cipriano Reyes, to set up a meat-packers union in opposition to the one controlled by the Communists. In return for a no-strike pledge Peron engineered a small wage rise and better conditions. This tactic of corporatism, fully integrating the unions into the State apparatus and thus controlling the working class, was met with hostility by sections of the ruling class, the aristocracy, the landowners and big ranchers, who were wedded to the old ideas of outright repression. Peron did this too with the metalworkers, where a union led by a Trotskyist, was set up in opposition to the Communists! Where he could not control, outright repression was used, as with the building workers. Those who objected to Peron's politics were imprisoned and tortured. Eva became a key player in this strategy. By now Peron had become Vice-President. He increasingly used nationalist rhetoric against British foreign investment and interests in Argentina (British companies owned most of the infrastructure - Argentina was virtually a British colony). The landowners and industrialists forced Peron to resign in 1945, after a wave of protests and strikes to defend the reforms put through by Peron. When Peron was arrested, Eva threw herself into frenetic activity to build up support among the unions. It is rumoured that the large amounts of cash used during this campaign was from that she had embezzled from the earthquake fund. In alliance with Cipriano Reyes, she visited many factories, docks and union HQs, singing the praises of Peron as the workers' friend. This culminated in a mass demonstration on October 17th, when 50,000 workers demonstrated in the capital. It was Eva who had shown remarkable resolve when Peron was wavering and preparing to go into exile. It was she who was a chief architect in mobilising the masses in a populist show of support for Peron. The following year Peron swept to power in a landslide election victory. In the next 3 years Eva, now officially married to Peron, would show how valuable she was to Peronism in enchanting the masses, tying them enthusiastically to the regime and thwarting any independent organisation of the working class. She began to deliver dramatic addresses to mass meetings and over the radio waves, bringing up her working class credentials, calling on the working class to back her and Peron. In the meantime she continued to do what she had been doing before Peron became President. She moved her relatives into positions of power. Her brother became Peron's private secretary. Husbands and lovers of her sister and mother were given influential positions. This nepotism benefited her family - it also allowed her access to provincial government, the Senate, the judiciary, communications, and her husband's daily schedule. At the same time she spent a fortune on jewellery, hats and clothes and an extravagant lifestyle - a long way from the lives of the people she made her impassioned speeches to. Then there was the Eva Peron Foundation. She had set this up when she had been refused the Presidency of a national establishment charity sponsored by upper class women, shortly after Peron became President. From a show of egotism, the Foundation developed into a kind of welfare state, which built hospitals, schools, orphanages and old peoples' homes, distributing food, medicine and money. But each act of the Foundation was used as a publicity stunt to show how benevolent Eva Peron was. At the same time many gimmicks were used as grist for the publicity mill. Very poor children were housed and fed for a few days and then flung back into poverty, peso notes were flung at random into the crowd. At the same time money was raised by the Foundation by a compulsory levy on union members (three days' pay) a national lottery and enforced contributions from the industrialists. The Foundation gained publicity for Peronism for its good deeds, it bolstered popular support through its "good deeds" - and Eva was able to divert up to $700 million into overseas accounts! The years 1946-9 saw workers' wages go up by a third. But in February 1949 the stock market collapsed and after this Peronism became more openly anti-working class, with austerity measures being introduced. Spending was cut by 20% and real wages fell by 32% between 1949 and 1953. In 1950 Eva Peron attempted to stop a railworkers strike. When the strike action spread the following year, the Peronists declared military rule, sacked 3,000 workers and jailed 300. She began to be associated with the brutal methods of the regime. Her early death in 1952 meant that the reputation she had built up was not too damaged by the increasing attacks of Peronism on the working class. In death she was transformed into a Virgin Mary style icon, a Saint of the Poor, easily managed in a predominantly Catholic country. In reality she was a corrupt and power-mad manipulator of the masses, helping bring about, in Juan Peron's own words "a fascism that is careful to avoid all the errors of Mussolini".